Scotland's biggest teaching union has voted to reject the latest pay offer by 57% to 43%. The Educational Institute of Scotland (EIS) will now move to ballot on strike action. The Scottish Secondary Teachers' Association (SSTA) union earlier voted to accept the pay deal. The Scottish government said it was the best pay deal for any public sector worker in the UK. It is offering a series of rises, some backdated, worth 9% by April and a further 3% next year. BBC Scotland understands the EIS aims to hold a strike ballot which would begin two weeks on Monday unless an improved pay offer is tabled. This could lead to industrial action by mid to late April. Unions have been pressing for a 10% rise, effective from last April, arguing that the real value of teachers' pay has fallen by a fifth over the past decade. EIS general secretary Larry Flanagan said members had voted "by a very clear majority" to reject the deal. He added: "The EIS remains open to further negotiations within the Scottish Negotiating Committee for Teachers but failing an improved offer, we will be initiating the process towards strike action." The teachers' pay campaign has gone on for more than a year. The threat of industrial action has always been there but unions hoped the very threat would be enough. The threat of a ballot by the EIS and the SSTA led to an improved offer being made, but the biggest union, the EIS, has turned that offer down. But is a significant improvement possible? Councils would argue they have no more money so the spotlight shifts to the Scottish government. The government would also be well aware of the possibility that a big pay rise for teachers will open the floodgates for similar claims by other public sector workers. But the last thing it wants is industrial action by teachers. More talks are planned but which side will blink first? Earlier the smaller SSTA union announced that its members had voted to accept the deal. The Association of Headteachers and Deputes in Scotland has also backed the offer. Seamus Searson, general secretary of the SSTA, said a pay rise for teachers was "long overdue". He added: "Members are equally unhappy with a three-year deal and are insisting on a re-opener clause for 2020 so that teachers' salaries are not allowed to deteriorate. "Urgent efforts" are needed to address teachers' workloads, he said, and to retain teachers who were thinking about leaving the profession. Deputy First Minister John Swinney said: "The offer put to teachers is the best pay deal in the UK for any public sector worker. It would see every teacher receive a minimum 9% pay increase by April this year with a further 3% next year. "Two out of the three trade unions balloted on this offer have voted in favour and the EIS decision is by a relatively narrow margin. A large number of teachers voted to accept the offer which clearly demonstrates the advantages they saw in the deal. "This strong offer remains on the table. Industrial action in any of our schools would not be in the interest of teachers, young people or parents." Image caption In October, a massive protest took place in Glasgow which is believed to have been attended by about 30,000 people. 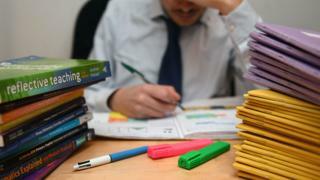 The NASUWT teaching union said feedback from its members suggested they were concerned about workload and indiscipline as well as the pay issue. General secretary Chris Keates said: "The severe year-on-year erosion of the once gold standard conditions of service, which supported Scotland's teachers in delivering high standards of education, has led to a growing crisis in the teaching profession."